Why Aren’t More People Visiting (The Country) Georgia? Many people around the world may not have heard of Georgia, the tiny republic sitting along the Caucus Mountain range, which many considered to be Europe’s eastern boundary in Central Asia. Many more have never considered it a travel destination, in fact of the 1.8 million visitors Georgia saw in 2011, less than 25% weren’t from bordering countries. 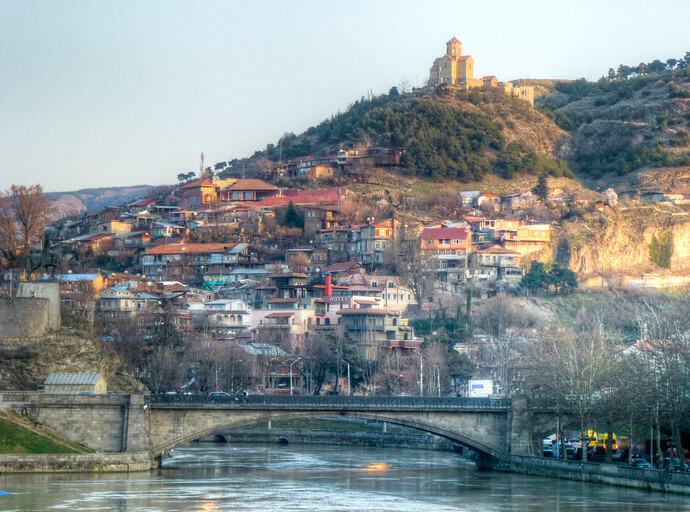 I spent some time this past April in Georgia, flying to Tbilisi from Istanbul (a 2.5 hour direct and inexpensive flight I might add) and the entire time I was there couldn’t stop asking myself – why aren’t more people visiting? Few countries and peoples have endeared themselves to me (and my wallet) as quickly as I experienced in Georgia. But while the country’s government has worked to increase tourism (most visibly with it’s easy entry rules for most nationalities) several things may currently be working against it. A big part due to a garbled media message for this gem in the Caucasus that won’t be hidden for long. Georgia is a small country, about the size of South Carolina, bordered by Russia, Azerbaijan, Armenia, and Turkey. Over the centuries it has had a close but often heated relationship with Russia and seen conquest by the Arabs, Persians, and Ottomans. (Something very evident both in Georgia’s artwork and cuisine.) Being at the crossroads of so many cultures and armies, similar to India, Georgia has absorbed and incorporated what it couldn’t repel militarily. That makes a visit to Georgia a rich cultural experience but difficult to refine into a narrow tourism message. Add on top of that arguably Georgia’s most famous national; Joseph Stalin, who was born in the city of Gori in 1878. A museum, statue, and shrine of the home he grew up in is in the town square. Or more like, is the town square. Landing in a new city you’re not familiar with at 3 in the morning as a traveler can be intimidating. It’s a time when you’re vulnerable to scams, fatigue, and heightened anxiety due to your awareness of both. It’s one of the disadvantages of not being a country that built some of the first airports (i.e. United States and much of Western Europe) or being a major connection hub. In Tbilisi, where the overwhelming majority of international travelers will land first, there is a train-metro station into the city; which unfortunately only runs until about 10pm. Most hostels, like Old Town Hostel I stayed at, do offer shuttle service for around 40 Lari (~$24 USD) which could end up being cheaper than negotiating one of the taxis around that hour. You may also have to book an extra night wherever you’re staying for a 5am arrival; one of 4 things non-planners should prepare for. You might be thinking that “Georgians” call themselves something similar in their language – no – they use the term “Kartvelebi”. So while every other person here does seem to be named George, or some variation of it, the translation of the country name is a rather odd one in English. (One of the many examples of such country and city confusion.) 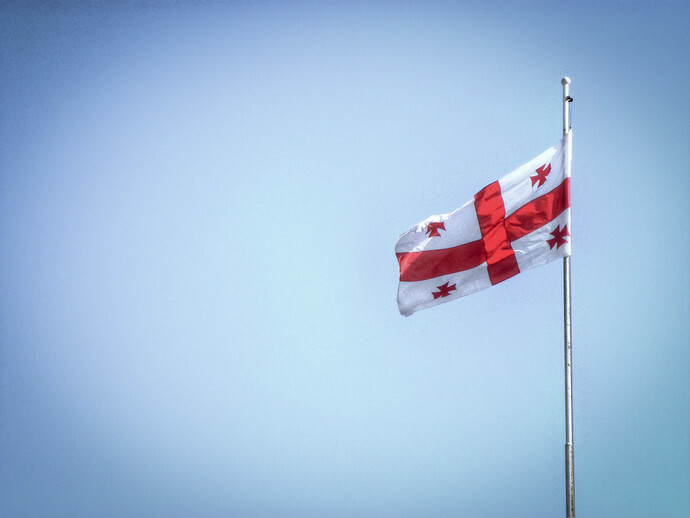 It is thought that “Georgia” was used by early European explorers because of their observation of the locals’ reverence for a particular Saint George. In any event, it’s not because of Britain’s King George II, whom the US state Georgia is named after. Either way, for many in the Americas, the Cola-Cola factory, deep-fried anything, and CNN probably come to mind before nigvziani badrijani. Naming conventions can make promotion – and even writing blog post titles – difficult, cumbersome, and less-distinguishable. Just imagine if Azerbaijan were named New York or Greece, Virginia. Americans may remember then-President George W. Bush’s visit to Georgia’s capital city, Tbilisi in 2005. During a public speech between Bush and Georgian President Mikheil Saakashvili, Vladimir Arutyunian threw a live grenade at the two; the explosive failing to detonate due to a malfunction. (Talk about luck for everyone within a 30 meter fatality radius.) Still, if this event made you think that Georgian’s are anti-American, it’s quite far from the truth. The Bush Administration was instrumental in negotiations between opposition parties after widely-disputed elections in 2003 and a strong supporter of the Rose Revolution shortly after. Much like you’ll find in northern Iraq, Bush is quite popular in Georgia; even the highway from the airport into the heart of Tbilisi is named after him. Then there is the Russian invasion and subsequent occupation of northern Georgia in 2008 where the fighting reached as far south as Gori. It is difficult to undo bad press, especially when there is so little of it from Georgia in the western media. While these issues may be working against Georgia’s tourism efforts, I don’t believe they will be for long. In the coming weeks I’ll be writing more about why you should consider visiting this Caucasus nation and the advantages of doing so, especially soon. After than, you’ll likely be asking yourself the same question I am – why aren’t more people visiting Georgia – and hopefully be happy you weren’t one who missed out. NextIs A Granada Card Worth The Cost? Bit sad that it’s necessary to add (the country) when speaking of Georgia, isn’t it? Georgia is high on my list, as are the other Caucasian countries. Look forward to your upcoming posts. I can see the confusion. Imagine if the country were named Rio or Alsace, people in Brazil and France would think of what’s closer; not a small country in the Caucuses. Too bad there isn’t some movement to change the name in English to something closer to what it is in Georgian! I second Sophie, I’ve been eyeing the Caucasus for years but haven’t gotten around to it yet. I can’t wait to see what else you put up from Georgia! Did you make it to Azerbaijan and Armenia, as well? Thanks Stephen, I’m excited to write more about it, Georgia somehow makes you feel a part of it quickly. I did visit Azerbaijan a few weeks after but not Armenia. I’ll need to do some visa research before making that trip. I dont recall reading what passport you’ve got (maybe it was in the Iraq posts?) but for me (US) Azerbaijan was the only one of the three that needed a pre-arranged visa, and the only source of problems was little Nagorno-Karabch. I’ve got both a Turkish and US passport, so that made Azerbaijan fairly easy as no visa is required (though I was still asked for a bribe); but didn’t look into Armenia as the border was closed for some time but now seems that 140 day visas are issued upon arrival for Turkish citizens. Dude, I loved Moldova! Did you get to Trans-Nistria? I ended up leaving the country before I got down there, but I’d love to see some photos and hear your take on the place. I will, it seems, (more) eagerly await new posts from you for the next few weeks! This post left me with Georgia on the brain. So, I’ve got a ticket through there and Azerbaijan for a few weeks in July. Thanks for the pish! Err, that was “push” obviously. My pleasure, that’s one of the best things I could hear! Thank you, thank you for this post! 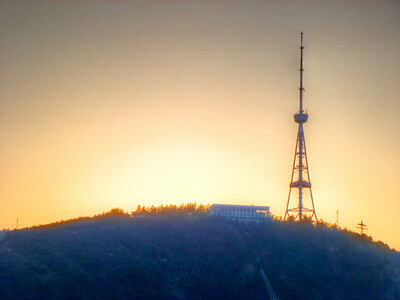 I’m a fanatic about traveling throughout Eastern Europe. I love this entire region and have traveled through the region for twenty years. I haven’t been to Georgia due to newspaper reports about political instability. I look forward to seeing more of your blog posts…. and then going there myself one day thanks to your great photos, experiences, and tips! I look forward to sharing them and would say this about Georgia, it’s remarkably safe (low crime rate)* and the political state is quite stable. Continued trends since 2008 in that country. Anil: You mention the “easy entry rules for most nationalities” – can you share (if you know) what those are for US citizens? Can I get a visa on arrival and how much is it and for how long? Barbara – US citizens don’t require a visa to visit Georgia and (I believe) can stay up to 90 days. I’m about to visit for the 3rd time in 2 months – it makes a nice transit point if you also want to visit Armenia and/or Azerbaijan as Tbilisi has a lot more (and cheaper) international flight options. Hi Barbara, it’s 90 days for US citizens, no cost and entry stamps are given upon entry. Given the recent troubles in the area it will take a few more years to build up tourist trust before they can expect to see the industry pick up. Here are two recent research articles on this topic, for those who go for that kind of thing: http://bit.ly/KN8H6m and http://bit.ly/Jh7hTg. Both, sadly are behind paywalls, but this much can be gotten from the abstracts: The 2008 war had the biggest depressive effect, and emphasizing the unique religious heritage of the country seems the strongest route for future marketing of the Georgia. Ugh, there needs to be a research article on my terrible grammar. It is all of those things you mention and I know you love Georgia too 🙂 There is so much to like and I want to get there again before it experiences a big tourism boom, which I think is inevitable. 😀 So many good reasons to visit and you like hiking…it has that going for it too! Wonderful information! Looking forward to reading more! Cheers for that. More coming up on Friday…! On researching ESL jobs, it seems there are a lot in Georgia. Other than that, I don’t really know that much about Georgia. Hope to change that! Funny you should mention that, I met quite a few people living there specifically to teach English! The Georgian government is making a big push for people to learn English – they’ve set up a program through which they’ve recruited I think over a thousand native English speakers to go teach there. Almost everywhere I go (I’m in Georgia now), people assume I’m here teaching English. I read your entry above. My son is in Tbilsi. He is married to a woman from there. He taught English in Tskaltsminda on the west coast for a year. Now he is Freelancing.He started there in 2012 . Perhaps you have met him? He is Rome Georgia now working and wanting to get his wife over here . I hope i hear from you. I would like to visit over there some day. I speeak German and Some Russian so maybe i can get by with the folks! I hope. take care. Let me know if I can live pretty good over there on say $1500 a month?? Very interesting post, and on a country not often written about. Will definitely be trying to get to Georgia as part of my European tour in 2013! Thanks Dave, I’d recommend a visit if possible and hope you get there in 2013! I’d love to visit Georgia and the neighbouring countries – Armenia and Azerbaijan. Looking forward to your upcoming posts! I’m happy to hear that, I’ve got so many stories from those countries (except Armenia which I didn’t make it to this time) it will have my editorial calendar full for a while! I almost considered teaching in Georgia, and might still do it in the future. I’ve heard so many nice things about the people there and the food too! Georgia is a wonderful place to visit, and the Georgian people are the most friendly people on the planet. I spent 3 months there in 1996 and Georgia is my favorite place on the planet! Even when they had no electricity and the average person made less in a month then the cost of a meal in the States, they would open then homes, provide an insane meal, with tons of Georgian toasting. I haven’t been back since, as my Georgian friends have all come to visit me! I can’t recommend visiting Georgia more. If you can stay with a family, even better! The fruits and vegetables are unbelievable and the wine is fantastic! I hope you get a chance to visit again, they’re still quite friendly! I’m planning a trip to Tbilisi – Georgia from New York City – USA: going to watch Futsal Cup Finals schedule April 26 – 28: any unusual activities to be aware of ? Can someone share their experiences with me, I travel a lot around the globe but this will be my first trip in this part of the world and look forward to it. Stopping through Georgia for 4.5 days at the end of August. Wondering where that top picture was taken? We are planning on two days in Tbilisi, 1.5 driving up the military highway towards Gergeti and seeing all those sites along the way, and one day in Telavi or somewhere else in the East. It might be tough to get in Gori with this schedule. Do you have any strong recommendations of things I should or shouldn’t see? The top photo is from Tbilisi, right in the middle of town. Honestly, if you’re tight on time, I’d say you can skip Gori and stick to the itinerary you listed above. Oh, and in Tbilisi, don’t miss a visit to Metekhi Church. Truth be known the main reasons people don’t visit Georgia much is due to native Georgians not letting go of their soviet union past although they’d never admit it.It doesn’t matter how respectful visitors are,fact remains regardless of how trendy Tbilisi is all foreigners are seen as a threat to their sovergnity.Russia occupys a large remote area of Georgia with military bases and has done so for many years.I retired in Georgia over 15 years ago and I’m always pleasant and respectful to everyone around me.To the new comers in Georgia welcome but you’ll experience the same as I have over the years.I live here because the weather is good and dirt cheap to live in Georgia.I speak their language fluently and have for 14 years now.The majority will smile in your face and stab you in the heart,it’s their personas.Don’t take my word for it though experience is the very best teacher.Such a beautiful country with many black hearted people.